In this Japanese name, the family name is Ōsaka. Last updated on: November 3, 2018. Naomi was born on October 16, 1997, in Chūō-ku, Osaka in Japan to Tamaki Osaka and Leonard François. Her mother is from Hokkaido, Japan, and her father is from Haiti. She has an older sister named Mari who is also a professional tennis player. The two girls were given their mother's maiden name for practical reasons when the family lived in Japan. Osaka's parents had met when her father was visiting Hokkaido while he was a college student in New York. Although Osaka was raised in the United States, her parents decided that their daughters would represent Japan. They said, "We made the decision that Naomi would represent Japan at an early age. She was born in Osaka and was brought up in a household of Japanese and Haitian culture. Quite simply, Naomi and her sister Mari have always felt Japanese so that was our only rationale. It was never a financially motivated decision nor were we ever swayed either way by any national federation." This decision may have also been motivated by a lack of interest from the United States Tennis Association (USTA) when Naomi was still a young player. The USTA later offered Naomi the opportunity to train at their national training center in Boca Raton when she was 16 years old, but she declined. Osaka never competed on the ITF Junior Circuit, the premier international junior tour, and only played in a small number of junior tournaments at any age level. She instead skipped to the ITF Women's Circuit and played her first qualifying match in October 2011 on her 14th birthday. She then made her professional main draw debut in doubles at her next tournament in March with her sister Mari. Meanwhile, she did not qualify for her first singles main draw until July in her seventh such attempt. Her best result of the 2012 season came at the ITF $10K event in Amelia Island, where she lost to her sister in the semifinals. Osaka has never won a title at the ITF level, only managing to finish runner-up on four occasions. Her first two finals came at the $25K level, one of which was in June 2013 in El Paso, Texas. The other was in March 2014 in Irapuato, Mexico and included a victory over her sister. In September 2013, Osaka turned professional shortly before turning 16 years old. She entered her first two qualifying draws on the WTA Tour that same month at the Challenge Bell in Québec and the Pan Pacific Open in Tokyo. The latter event was her first opportunity to compete professionally in Japan. The following summer, Osaka qualified for her first WTA main draw at the 2014 Stanford Classic. In her tour level debut, she upset world No. 19 Samantha Stosur in a tight match where she saved a match point in the second set tiebreak and came back from a 5–3 deficit in the third set. She was still just 16 years old and ranked No. 406 at the time. Osaka also won a match as a wild card at the Japan Women's Open, her only other WTA main draw of the year. These victories helped her progress into the top 250 of the WTA rankings before the end of the season. Despite not winning another WTA main draw singles match in 2015, Osaka continued to climb up the rankings. She reached her two highest level ITF finals, the first at the $75K Kangaroo Cup in Japan and the second at the $50K Surbiton Trophy in the United Kingdom. Following these runner-up results, Osaka was ranked high enough to enter qualifying at the last two Grand Slam singles events of the year, Wimbledon and the US Open. She won her first match at the US Open, but was unable to qualify for either main draw. Nonetheless, Osaka had a strong finish to the year. In October during the WTA Finals, she won the Rising Stars Invitational four-player exhibition tournament, defeating heavy favorite and world No. 35 Caroline Garcia in the final. Continuing to play in November, Osaka then reached the biggest final of her career at the WTA 125K Hua Hin Championships in Thailand. After a semifinal at a $75K event in Japan, she finished the year ranked No. 144. Osaka began the season playing three tournaments in Australia. Her results during this stretch were good enough to bring her near the top 100, which allowed her to play in WTA Tour-level events all year. Most notably, she qualified for her first Grand Slam main draw at the Australian Open and made it to the third round. In particular, she upset No. 21 Elina Svitolina in straight sets in the second round before losing to No. 16 Victoria Azarenka. Back in the United States, Osaka received a wild card into the Miami Open, her first Premier Mandatory main draw. During the event, she won two matches including a victory over No. 18 Sara Errani. With this success, she progressed into the top 100 of the WTA rankings for the first time. In the clay court events leading up the French Open, Osaka needed to qualify for every event she entered. She only managed to do so at a single event, the Charleston Open, where she lost her only match in the main draw. Nonetheless, Osaka was ranked high enough to be directly accepted into the main draw of the French Open. In her debut at the tournament, she recorded her only two clay court match wins of the season. She also won the first set against No. 6 Simona Halep, but ultimately lost the match. She then did not play the grass court season after suffering an injury shortly after the French Open. Osaka returned to tennis in the middle of July. At the US Open in August, she reached the third round at a Grand Slam event for the third time this year. She upset No. 30 CoCo Vandeweghe in the first round before losing to No. 9 Madison Keys in three sets. During her match against Keys, she had a 5–1 lead in the third set before ultimately losing in a tiebreak. After the tournament, Osaka began the Asian hard court season with two tournaments in Tokyo, first losing in the second round at the Japan Women's Open. Having already reached her first two career WTA quarterfinals earlier in the year, she then made her breakthrough as a wild card at the Premier level Pan Pacific Open. She upset No. 12 Dominika Cibulková and No. 20 Svitolina on the road to making her first WTA final at the age of 18. At the time, Cibulkova was the highest ranked player she ever defeated. Additionally, she was the first Japanese player to contest the final at the event since Kimiko Date in 1995. Osaka ultimately finished runner-up to Caroline Wozniacki. Nonetheless, she entered the top 50 of the WTA rankings for the first time. At the end of the season, she was named the WTA Newcomer of the Year. After her huge improvement the previous year, Osaka was unable to set a new career high ranking in 2017. Nonetheless, she maintained a steady ranking throughout the season, rising no higher than No. 44 while falling no lower than No. 68, her year-end ranking. She did not win more than two main draw matches at any event all year. Osaka's best tournament result of the season came at the Canadian Open, where she reached the round of sixteen as a qualifier. During the event, she upset No. 16 Anastasija Sevastova before needing to retire against world No. 1 Karolína Plíšková due to an abdominal injury. She had won the second set against Plíšková. Her next best results of the year came at the last two Grand Slam events of the season, where she made it to the third round at each of Wimbledon and the US Open. She had a strong debut at Wimbledon, upsetting No. 23 Barbora Strýcová before losing to No. 11 Venus Williams. Her US Open was then highlighted by her first round win against defending champion and No. 6 Angelique Kerber, the first top ten victory of Osaka's career. However, her run was ended by veteran qualifier Kaia Kanepi. This was the second consecutive year she lost in the third round of the US Open after having at least a one-break lead in the third set. Osaka in particular struggled playing on clay courts. After winning her first two matches at the Charleston Open, she did not win another main draw match on clay the remainder of the season. Osaka did well in her first full grass court season on the WTA Tour, going 4–4 behind her performance at Wimbledon. Her biggest wins of the year all came on hard court. In addition to her results at the Canadian Open and the US Open, she also recorded a second top ten victory over No. 5 Venus Williams at the Hong Kong Open, her last tournament of the year. Following her lack of improvement in 2017, Osaka hired Sascha Bajin to be her coach in the offseason. In their second tournament together, Osaka produced her career best result at a Grand Slam event. At the Australian Open, she reached the fourth round after defeating two top twenty players in Elena Vesnina and hometown favorite Ashleigh Barty, ultimately losing to world No. 1 Simona Halep. This result helped her return to the top 50 within the next month. At the Indian Wells Open, Osaka had the next big breakthrough of her career. Having never won a professional title or made it past the third round at a Premier Mandatory event, she won the tournament convincingly, only dropping one set in the middle round of the tournament. In the quarterfinals and semifinals, she defeated two top five opponents in Karolína Plíšková and Halep, the latter of which was her first victory over a current world No. 1 player. She then closed out the tournament with a win in the final over fellow up-and-coming player Daria Kasatkina, making her the youngest champion at the event in ten years. With her first title, she surged past her previous career high ranking to No. 22 in the world. Osaka played the following week as well at the Miami Open and extended her win streak by one additional match in her first ever meeting against her childhood idol Serena Williams, who was competing in just her second tournament back from maternity leave. After her success in the early months of the season, Osaka had a relatively quiet middle of the year. She reached the third round at both the French Open and Wimbledon, matching her best performance at each tournament. The closest she came to winning another tournament was on grass at the Nottingham Open, where she lost to top seed Barty in the semifinals. Osaka did not have another breakthrough result until the US Open, where she won her second title of the year. Like at Indian Wells, she only dropped one set in the middle round of the event, this time to No. 20 Aryna Sabalenka. In the three early rounds, she only lost a total of seven games and notably recorded a double bagel victory against Aliaksandra Sasnovich. Osaka was drawn against Madison Keys in the semifinals, and was able to avenge her tough loss from the 2016 US Open to advance to the final. In the final, she defeated Serena Williams for the second time in 2018 to win her first major title. The match was marred by an on-court dispute between Williams and the umpire highlighted by Williams receiving an unusual game penalty and boos from the crowd both during the match and the award ceremony. Osaka later said that the win was "a little bit bittersweet" and "it wasn't necessarily the happiest memory." Nonetheless, she became the first Japanese woman to contest a Grand Slam singles final and the first Japanese Grand Slam singles champion. Now ranked in the top ten, Osaka extended her win streak to ten matches by reaching the final at the Pan Pacific Open in Tokyo for the second time in her career. Plíšková was able to end her win streak in the final. Osaka then reached the semifinals at the Premier Mandatory China Open. With her third consecutive deep run, she rose to a career best ranking of world No. 4, matching the record of Kimiko Date and Kei Nishikori for the highest ranking held by a Japanese player in history. Osaka closed out the year by participating at the WTA Finals, where she was grouped with Sloane Stephens, Angelique Kerber, and Kiki Bertens. She lost all three of her round robin matches, notably retiring against Bertens due to a hamstring injury to end her season. Osaka finished the year as the WTA Tour leader in prize money, having earned almost $6.4 million. Osaka entered the Australian Open as the fourth seed and also one of eleven players in contention for the world No. 1 ranking. She made it to the final against Petra Kvitová, despite No. 27 Hsieh Su-wei coming close to defeating her in the third round after taking a 40–0 lead in her service game at 4–2 in the second set, having already won the first set. Anastasija Sevastova also won the first set against her in the fourth round, while No. 8 Karolína Plíšková pushed her to three sets in the semifinals. After Osaka won the first set in the final, Kvitová saved three championship break points before breaking Osaka in back-to-back service games to win the second set. Nonetheless, Osaka recovered to win the championship. She was the first woman to win consecutive Grand Slam singles titles since Serena Williams in 2015, and was the first player to follow up her first Grand Slam singles title with another at the next such event since Jennifer Capriati in 2001. She also became the first Asian player to be ranked No. 1 in the world in singles. Despite this title, she parted ways with her coach Sascha Bajin following the tournament. Osaka made her Fed Cup debut for Japan in 2017, while the team was competing in the Asia/Oceania Zone Group I. Japan won all nine of their rubbers to advance out of their round robin pool. Although Osaka won her singles match in the play-off against Kazakhstan, the team lost their other two matches and was not able to advance. The following year with Osaka absent, Japan was able to defeat Kazakhstan in the same group to advance to the 2018 World Group II Play-offs. In this stage, they hosted Great Britain in a usual five rubber tie. At this point, Osaka returned to the team and won her opening match against Heather Watson. After she lost her next rubber to Johanna Konta, Kurumi Nara was also able to defeat Watson to set up a decisive doubles match. Japan won that final rubber to earn promotion to World Group II in 2019. Osaka made her Hopman Cup debut in 2018 with Yūichi Sugita. Japan was making their first appearance at the exhibition tournament since 2001. They were grouped with Switzerland, the United States, and Russia, and lost all three of their ties. Osaka's only match win came in singles against Russian Anastasia Pavlyuchenkova. She also had a big highlight in the mixed doubles match against Switzerland when she served an ace past Roger Federer. Osaka is an aggressive baseline player. She has excellent raw power, especially on her forehand and her serve. Osaka could hit 100 miles per hour (160 km/h) forehands at the age of sixteen, and her serve has been clocked at up to 125 miles per hour (200 km/h), making her one of the ten fastest servers on record in WTA history. While she can use her power to hit high numbers of winners, Osaka's key to success is to be able to win long rallies. One of the first notable instances in which that strategy proved successful was when Osaka made her first career WTA final at the 2016 Pan Pacific Open. Osaka credited improving her mental approach and cutting down on unforced errors for her breakthrough season in 2018. At the Wuhan Open towards the end of the year, she noted that, "I think my biggest improvement is mental. My game is more consistent, there are not so many unforced errors. I'm not sure how many I hit today, but sometimes last year I was hitting a lot!" She attributed some of these changes to her coach Sascha Bajin, saying, "Since I was working with [Bajin] — and I tend to be a bit negative on myself — I feel like I've gotten a little bit more optimistic ... I fight myself a lot, so he's sort of been, like, the peacemaker." Bajin also agreed with Osaka on the impact of having a patient, positive approach in each match. Osaka was coached by her father Leonard François from the age of three. Patrick Tauma was one of her first coaches after she began playing on the ITF Women's Circuit. He was her coach in 2013 when she reached her first ITF final. In 2014, she spent seven months training at an academy run by Harold Solomon, a former top five player and French Open finalist who has coached many top women's tennis players including Jennifer Capriati and Mary Joe Fernández. Under Solomon, Osaka defeated Sam Stosur for her first WTA match win. Following her loss at the 2016 US Open where she could not convert a 5–1 lead in the third set, the Japan Tennis Association helped arrange for David Taylor to be her new coach. After a lackluster 2017 season, she switched coaches to Sascha Bajin, who had previously served as a hitting partner to top players such as Serena Williams, Victoria Azarenka, and Caroline Wozniacki. With Bajin as her coach, Osaka won her first Premier Mandatory title and two Grand Slam singles titles. She also rose to No. 1 in the world after having never previously been ranked above No. 40. Bajin was named the inaugural WTA Coach of the Year in 2018. Shortly after her 2019 Australian Open title, Osaka surprisingly split with Bajin, saying, she "wouldn’t put success over [her] happiness." She hired Jermaine Jenkins to be her new coach the following month. Jenkins had previously worked as a hitting partner for Venus Williams. Osaka has been represented by the IMG management company since 2016. The Japanese sporting equipment manufacturer Yonex has supplied her with rackets since 2008. She plays with the Yonex Ezone 98 racket, equipped with Polytour Pro 125 and Rexis 130 strings. Adidas was her apparel sponsor from 2015 until 2019 when she switched to Nike. Osaka is a brand ambassador for Japanese automobile manufacturer Nissan and Japanese electronics manufacturer Citizen Watch. She also endorses several other Japanese companies, including noodle maker Nissin Foods, cosmetics producer Shiseido, the broadcasting station Wowow, and airline All Nippon Airways. Osaka has a multi-ethnic background, with her father being born in Haiti and her mother being from Japan. She has been described as various combinations of Japanese, Haitian, and American by the media. She has said, "My dad's Haitian, so I grew up in a Haitian household in New York. I lived with my grandma. And my mom's Japanese and I grew up with the Japanese culture too, and if you're saying American, I guess because I lived in America, I also have that too." Her Haitian grandparents only spoke to her in Creole because they did not know English, while her mother conversed with her in Japanese. Osaka has dual American and Japanese citizenship. [a] She can understand Japanese, but is not very confident speaking the language. She has said, "I can understand way more Japanese than I can speak." At press conferences, Osaka can take questions in Japanese but typically will answer them in English. Osaka's background is particularly unusual given that she represents Japan, one of the most racially homogeneous countries in the world. In Japan, she is referred to as a hāfu, meaning that she is half-Japanese. Osaka's Japanese grandparents did not initially accept her parents' relationship. This led to her parents relocating from Hokkaido to Osaka, where she and her sister were born. As a result, her mother did not have contact with her family for nearly 15 years and Osaka did not get the chance to return to Japan until she was 11 years old. Her grandparents did not initially support her parents for building their daughters' lives around tennis. However, they later began to support Osaka as a tennis player following her unexpected upset of Sam Stosur in her WTA Tour debut. They were also proud of her in particular for winning the 2018 US Open. Osaka has a shy, reserved personality. Her former coach Sascha Bajin was initially confused by her personality, saying, "I thought she was a little bit more of a diva because she didn't talk much. She doesn't really look at someone's eyes, but that's just because she was always so shy ... Back then I didn't know for what reason." Osaka is also very frank and is regarded as having a dry sense of humor. During her 2018 Indian Wells Open victory speech, she began by saying "Um, hello ... I'm Naom ... oh never mind" and later noted, "This is probably going to be the worst acceptance speech of all time" after being worried about forgetting who to thank, and appearing to nearly forget to thank her opponent Daria Kasatkina as well as one of her sponsors Yonex. Current through 2019 Australian Open. ^ Japan’s Nationality Act requires dual citizens to choose a nationality by the age of 22; however, the Japanese government does not enforce this provision. Although some dual citizens have chosen to revoke one of their nationalities because of the law, others have opted to keep both of their citizenships without penalty. The Japan Times has stated, "it would be highly unusual if Naomi Osaka was forced to relinquish her US citizenship at the age of 22." ^ a b c d e f g h i j k l "Naomi Osaka". ITF Tennis. Retrieved October 30, 2018. ^ "Naomi Osaka". WTA Tennis. Retrieved November 3, 2018. ^ a b c d e f g h Larmer, Brook (August 23, 2018). "Naomi Osaka's Breakthrough Game". The New York Times. Retrieved August 27, 2018. ^ a b Noori Farzan, Antonia (September 10, 2018). "Japanese, Haitian, and now a Grand Slam winner: Naomi Osaka's historic journey to the U.S. Open". Washington Post. Retrieved September 11, 2018. ^ a b "Naomi Osaka Tennis Biography". Patrick Tauma. Retrieved November 3, 2018. ^ a b c Downs, Tom. "Naomi Osaka: Japanese Firepower". Tennis View Magazine. Retrieved November 3, 2018. ^ a b c Perrota, Tom. "Naomi Osaka: The Tennis Star Who Was Overlooked by Everyone". Wall Street Journal. Retrieved November 3, 2018. ^ a b c "Naomi Osaka Statistics". Core Tennis. Retrieved October 30, 2018. ^ Uchida, Akira. "大坂なおみが18年間を振り返る「お姉ちゃんこそ最大のライバル」" [Naomi Osaka looks back over 18 years: 'My sister is my biggest rival']. Sportiva (in Japanese). Retrieved October 30, 2018. ^ "Naomi Osaka: US Open champion's career in pictures". CNN. September 11, 2018. Retrieved October 9, 2018. ^ "Qualifier Stuns Stosur In Stanford". WTA Tennis. Retrieved October 30, 2018. ^ Nguyen, Courtney. "Watch: 16-year-old standout Naomi Osaka hits a massive forehand". Sports Illustrated. Retrieved October 30, 2018. ^ "Keys, Svitolina, Watson advance at Japan Women's Open". Tennis.com. Retrieved October 30, 2018. ^ a b c d e f g h i j "Naomi Osaka Rankings History". WTA Tennis. Retrieved October 30, 2018. ^ "Osaka Wins WTA Rising Stars Invitational". WTA Tennis. Retrieved October 30, 2018. ^ Lisanti, Jamie (January 23, 2016). "Australian Open Day 6: Keys beats Ivanovic after scare; Muguruza exits". Sports Illustrated. Retrieved September 11, 2018. ^ "Vamos Rafa! A Popular Nadal Tries Again At Miami Open". CBS Miami. Associated Press. Retrieved October 31, 2018. ^ "Halep eliminates teenager Osaka in third-round match". Japan Times. Associated Press. Retrieved October 31, 2018. ^ Sarkar, Pritha. "Osaka falls short of acing a Japanese test". Reuters. Retrieved October 31, 2018. ^ "Osaka Brilliant In Brazil". WTA Tennis. Retrieved October 31, 2018. ^ "Osaka wins in U.S. Open debut; Olympic champ Puig falls". Japan Times. Retrieved October 31, 2018. ^ "Down 5–1 in third set, Madison Keys storms back to stun Naomi Osaka in Third Round". Tennis.com. Retrieved October 31, 2018. ^ "Zhang Topples Osaka In Tokyo". WTA Tennis. Retrieved October 31, 2018. ^ McKirdy, Andrew. "Overpowering Osaka eliminates Cibulkova". Japan Times. Retrieved October 31, 2018. ^ "Wozniacki Returns To Tokyo Final After Radwanska Upset". WTA Tennis. Retrieved October 31, 2018. ^ "Wozniacki Wins First 2016 Title In Tokyo, Knocks Out Japanese Teen Osaka". WTA Tennis. Retrieved October 31, 2018. ^ "Osaka: WTA Newcomer Of The Year". WTA Tennis. Retrieved October 31, 2018. ^ "Pliskova serves up Toronto quarterfinal spot". WTA Tennis. Retrieved November 1, 2018. ^ Culpepper, Chuck (July 5, 2017). "Venus Williams advances in her 20th Wimbledon. Her next opponent has been alive for 19 of them". Chicago Tribune. Retrieved October 16, 2017. ^ Harwitt, Sandra (July 7, 2017). "Venus Williams tested, beats Naomi Osaka at Wimbledon". USA Today. Retrieved October 16, 2017. ^ Rothenberg, Ben. "Naomi Osaka Ousts Angelique Kerber, the Defending Champion, at the U.S. Open". New York Times. Retrieved November 1, 2018. ^ "Top 5 Upsets of 2017 (No. 5): Osaka sends Kerber crashing out in New York". WTA Tennis. Retrieved November 1, 2018. ^ "Tennis: Tearful Osaka lays out broken heart after US Open loss". Straits Times. Agence France-Presse. Retrieved November 1, 2018. ^ "Kaia Kanepi – Naomi Osaka". Flashscore.com. Retrieved November 1, 2018. ^ "Rogers Rolls Past Osaka To Reach First Charleston QF". WTA Tennis. Retrieved November 1, 2018. ^ "Naomi Osaka shocks her idol Venus Williams in Hong Kong". Sport360. Retrieved November 1, 2018. ^ Moorman, Gale (December 13, 2017). "Will Sascha Bajin be the key to open Naomi Osaka's game in 2018?". Tennis World. Retrieved October 17, 2018. ^ "Coaching in the Bigs: Sascha Bajin on His Coaching Strategies". Tennis Channel. January 24, 2018. Retrieved October 17, 2018. ^ "Naomi Osaka rolls past Elena Vesnina to reach third round of Australian Open". Japan Times. Associated Press. Retrieved November 2, 2018. ^ Mitchell, Kevin (January 20, 2018). "Ashleigh Barty's Australian Open ended by assured Naomi Osaka". Guardian. Retrieved March 8, 2018. ^ Newbery, Piers (January 22, 2018). "Australian Open: Simona Halep beats Naomi Osaka to reach quarter-finals". BBC. Retrieved March 8, 2018. ^ "Osaka serves up Pliskova upset, books Halep semifinal". WTA Tennis. Retrieved November 2, 2018. ^ "Osaka overwhelms Halep to reach Indian Wells final". WTA Tennis. Retrieved November 2, 2018. ^ a b "Osaka conquers Kasatkina to win first title in Indian Wells". WTA Tennis. Retrieved November 2, 2018. ^ Tsuji, Alysha. "Naomi Osaka had the greatest reaction to beating Serena Williams at Miami Open: 'Omg'". USA Today. Retrieved November 2, 2018. ^ Tignor, Steve (June 1, 2018). "Keys showed "veteran moves" and capacity for clay in win over Osaka". Tennis.com. Retrieved September 10, 2018. ^ Juzwiak, Jason (July 7, 2018). "Kerber cruises past Osaka to make Wimbledon fourth round". WTA Tennis. Retrieved September 10, 2018. ^ Chiesa, Victoria (June 16, 2018). "Barty overwhelms Osaka in Nottingham semis". WTA Tennis. Retrieved September 10, 2018. ^ "Is Naomi Osaka ready for a Grand Slam title? Is Naomi Osaka ready for a Grand Slam title?". US Open. Retrieved November 2, 2018. ^ Drucker, Joel. "Dream Come True: Osaka beats Keys to set up final against Serena". Tennis.com. Retrieved November 2, 2018. ^ Wallace, Ava (September 8, 2018). "Naomi Osaka upsets Serena Williams, who received game penalty, to win 2018 U.S. Open". Washington Post. ^ "Naomi Osaka: US Open title 'not the happiest moment' after Serena Williams' outbursts". BBC Sport. October 1, 2018. Retrieved October 4, 2018. ^ Newman, Paul (September 7, 2018). "Naomi Osaka becomes first Japanese woman to reach a Grand Slam final". Evening Standard. Retrieved September 10, 2018. ^ a b Kane, David. "Osaka stuns Serena, captures first Grand Slam title at US Open". WTA Tennis. Retrieved November 2, 2018. ^ "'With every win I feel better' – Pliskova powers to Tokyo title, snaps Osaka streak". WTA Tennis. Retrieved November 2, 2018. ^ "Anastasija Sevastova defeats Naomi Osaka in China Open semifinals". Japan Times. Retrieved November 2, 2018. ^ Berkok, John. "Naomi Osaka historically reaches No. 4 in the WTA rankings". Tennis.com. Retrieved November 2, 2018. ^ "'It's never nice to win a match like this': Bertens into WTA Finals SF after Osaka injury". WTA Tennis. Retrieved November 2, 2018. ^ "U.S. Open Champion Naomi Osaka Tops Simona Halep In Money Rankings". Forbes. Retrieved November 3, 2018. ^ Nguyen, Courtney. "Australian Open 2019: Eleven players vying for No.1 spot in Melbourne". WTA Tennis. Retrieved 11 March 2019. ^ Crouse, Karen. "At Australian Open, Osaka Holds Off Hsieh, a Big-Seed Slayer With a Bedeviling Slice". New York Times. Retrieved 11 March 2019. ^ "Osaka outlasts Sevastova for first Australian Open quarterfinal". WTA Tennis. Retrieved 11 March 2019. ^ "Naomi Osaka outplays Karolina Pliskova to reach Australian Open final". Japan Times. Associated Press. Retrieved 11 March 2019. ^ Trollope, Matt. "Top of the world: Osaka wins AO title, takes No. 1 ranking". Australian Open. Retrieved January 26, 2019. ^ Ganguly, Sudipto (January 26, 2019). "Osaka edges Kvitova to claim Australian Open crown". Reuters. Retrieved January 26, 2019. ^ "Osaka clinches second straight Slam, No.1 ranking at Australian Open over Kvitova". WTA Tennis. Retrieved 11 March 2019. ^ a b "Split with Bajin not over money: Osaka". Reuters. Retrieved 10 March 2019. ^ "Kazakhstan seals World Group II play-offs berth". Fed Cup. Retrieved November 3, 2018. ^ "Japan books place in World Group II play-offs". Fed Cup. Retrieved November 3, 2018. ^ "Japan and Great Britain level in Miki". Fed Cup. Retrieved November 3, 2018. ^ "Japan books its place among the world's elite for 2019". Fed Cup. Retrieved November 3, 2018. ^ Han, Don. "Hopman Cup Group B Preview: Japan vs Switzerland". Vavel. Retrieved November 3, 2018. ^ "Swiss tennis champion Roger Federer aced by Japan's Naomi Osaka in Hopman Cup". Nine.com.au. December 31, 2017. Retrieved October 4, 2018. ^ "All You Need To Know About US Open Star Naomi Osaka". BeiN Sports. Retrieved November 3, 2018. ^ a b c Thomas, Louisa. "The Thousand Autumns of Naomi Osaka". Racquet Magazine. Retrieved November 3, 2018. ^ Joseph, Adi (August 29, 2017). 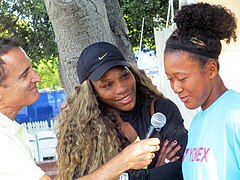 "Who is Naomi Osaka? 19-year-old stole U.S. Open spotlight with Round 1 upset". USA Today. Retrieved October 16, 2017. ^ "SAP Coaches View: Osaka Outlasts In Tokyo". WTA Tennis. Retrieved November 3, 2018. ^ "'My best performance yet' – Osaka steams past Goerges in Beijing". WTA Tennis. Retrieved November 3, 2018. ^ a b c Osborn, Richard. "Naomi Osaka's coach Sascha Bajin juggles coach, peacemaker roles". US Open. Retrieved November 3, 2018. ^ Moorman, Gale. "Is Naomi Osaka a quiet warrior?". Tennis World USA. Archived from the original on March 17, 2018. Retrieved November 3, 2018. ^ Oddo, Chris. "TN Q & A: Harold Solomon". Tennis Now. Retrieved November 3, 2018. ^ Nguyen, Courtney. "Sascha Bajin in it for the long haul with Osaka: 'I've paid my dues'". WTA Tennis. Retrieved November 3, 2018. ^ "Osaka's coach, Bajin, wins 1st WTA Coach of the Year award". USA Today. Associated Press. Retrieved March 10, 2019. ^ "Osaka's split with coach shocks tennis world". Japan Times. Retrieved March 10, 2019. ^ Nguyen, Courtney (28 February 2019). "Naomi Osaka hires Jermaine Jenkins as new coach". wtatennis.com. Retrieved March 7, 2019. ^ Gatto, Luigi. "Naomi Osaka signs with IMG". Tennis World USA. Retrieved November 3, 2018. ^ a b Anzai, Akhide. "Naomi Osaka serves Japan brands a golden Olympic opportunity". Nikkei. Retrieved November 3, 2018. ^ "Naomi Osaka (JPN)". Yonex. Retrieved November 3, 2018. ^ "Naomi Osaka close to signing historic deal with Adidas". New York Post. Retrieved November 3, 2018. ^ Anderson, Philip. "Naomi Osaka switches from Adidas to Nike!". Tennis World. Retrieved 6 April 2019. ^ "Citizen nominates tennis pro Naomi Osaka as new brand ambassador". Citizen Watch. Retrieved November 3, 2018. ^ Newcomb, Tim. "The Continued Rise Of Naomi Osaka And Her Business Star". Forbes. Retrieved November 3, 2018. ^ Du, Lisa. "Shiseido signs tennis star Osaka to help expand global appeal". The Jakarta Post. Retrieved November 29, 2018. ^ "All Nippon Airways announces sponsorship for tennis champion Naomi Osaka". Business Traveller. Retrieved January 27, 2019. ^ Tsuji, Alysha. "Naomi Osaka is a 19-year-old Japanese-American tennis player". USA Today. Retrieved September 9, 2018. ^ Ramsay, Alix. "New horizons open up for Serena Williams and Naomi Osaka". The Scotsman. Retrieved September 9, 2018. ^ "Naomi Osaka dominates Daria Kasatkina". The Indian Express. Retrieved September 9, 2018. ^ McCarvel, Nick. "Rising Japanese tennis star Naomi Osaka is very dangerous". USA Today. Retrieved September 9, 2018. ^ Johnson, Jasmine. "20 year old tennis phenom". The Grio. Retrieved September 9, 2018. ^ "What does Japan's Nationality Act really mean for its dual citizens?". Japan Times. Retrieved 29 March 2019. ^ a b Barron, Laignee (September 7, 2018). "Rising Tennis Star Naomi Osaka Always Looked Up to Serena Williams. Now She's Facing Her in the U.S. Open Final". Time. ^ Sarkar, Pritha. "Tennis-Osaka falls short of acing Japanese test". Reuters. Retrieved November 3, 2018. ^ Maine, D'Arcy. "Want to LOL? Just listen to anything rising star Naomi Osaka has to say". espnW. Retrieved November 4, 2018. ^ Kamimura, Masafumi. "Naomi Osaka's grandfather in Hokkaido safe and proud". The Asahi Shimbun. Retrieved November 3, 2018. ^ Santhanam, Anuradha. "US Open 2018: Naomi Osaka, the new face of tennis, gears up for another battle against 'biggest idol' Serena Williams". First Post. Retrieved November 4, 2018. ^ "'Worst acceptance speech of all time': Nervous Osaka claims victory". Sydney Morning Herald. Retrieved November 3, 2018. ^ "Get used to more speeches – Naomi Osaka has all the attributes to reach the very top". The National. Retrieved November 4, 2018. 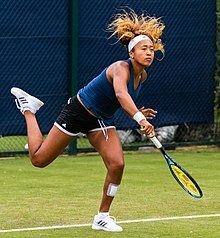 Wikimedia Commons has media related to Naomi Osaka.